Johnny Favorite Presents - Sacramento's Home of Live Band Karaoke and more! Take all of your favorite bands and have them play your favorite songs, all on one stage, all in one night. This is what audiences coming to see Johnny Favorite's shows have come to love and expect. Johnny Favorite presents customizable shows. Custom because you design the perfect performance for you and your crowd. You start with Johnny's core band as the center of it all and then have the option to add on musicians, vocalists, themes and production elements that will deliver the ultimate live music experience to your guests. Corporate & Private Parties, Holiday Functions, Weddings, Festivals, Nightclub Events and Singing Contests. Frank did it his way, Johnny does it your way by presenting JUKEBOX JOHNNY - your personal cover band! You and your guests get to design your own custom show by choosing any of the hundreds of songs off of Johnny's list of favorite tunes spanning seven decades. What do you want to hear? Let's Rock! 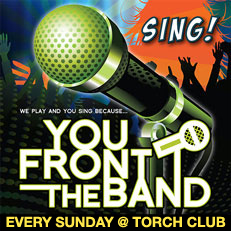 We play and you sing because YOU FRONT THE BAND! Back up vocals by the band. The ultimate interactive rockstar experience for you and your guests. Grab the mic! Shaken and stirred! Johnny's GREEN FEDORA cats lay down jazzy versions of rock and pop hits that add to the ambiance of any soirée. The perfect acoustic set for cocktail hours, dinner service and as a prelude to Johnny's rocking shows. Copyright 2013 Johnny Favorite Presents All rights Reserved.